“The demands from our contract manufacturing division sees us working with suppliers who can meet our specific needs, delivering quality products and services – Chieftain Fabrics are definitely one such supplier”. As Aviation Week’s show MRO moves around the globe, Concept Furniture International moves with it – this year the prestigious event was held in the Spanish capital Madrid and was a huge success, the perfect mix of fantastic exhibitors, weather & location made it an event to remember. Concept Furniture International are the official furniture supplier to MRO supplying both space only and shell scheme areas with original designs and a wide range of soft furnishings that are upholstered using Chieftain fabrics leatherette vinyl. 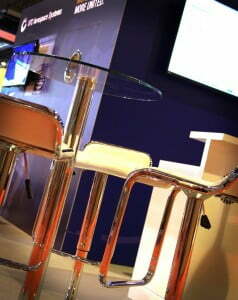 Milanos DT20 seating at The MRO Europe Exhibition, Madrid, Spain. 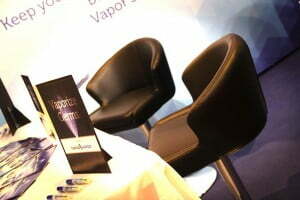 Jojo and Bow seating at The MRO Europe Exhibition, Madrid, Spain. 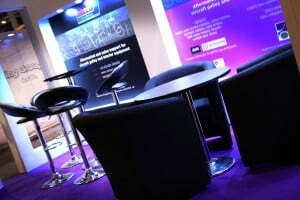 Oakley black seating at The MRO Europe Exhibition, Madrid, Spain. With the bespoke and rental segments of the business growing rapidly we have been able to work with high-end clients and showcase our work on many platforms. The diverse textures and colours Chieftain offer help us add value to our proposition and exceed customer needs.